In this video we will discuss async and await keywords and their purpose with an example. Let us create a simple Windows Forms Application that counts the number of characters in a given file. Let us assume the file is very big and it takes around 5 seconds to read and count the number of characters in the file. 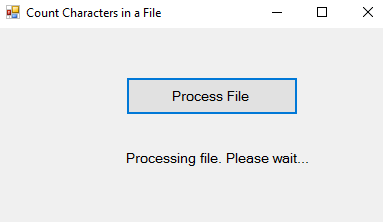 When the "Process File Button" is clicked, the application should display the message "Processing File. Please wait". 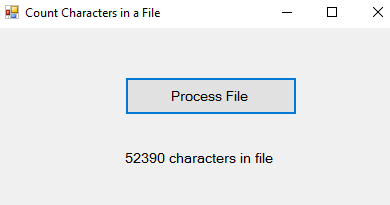 As soon as the application finishes processing the file it should display the the number of characters as shown below. Another improtant requirement is that the application should remain responsive throughout the entire process, i.e when the application is busy processing the file the application should not hang and we should still be able to interact with the application. We should be able to click with in the other controls on the form, move the form around on the screen, resize it if required etc. Let us first create the Windows Forms Application without using async and await keywords and see how it behaves. Here are the steps. 1. In your C: drive, create a new folder. Name it Data. In the folder create a new Text Document. Name it Data.txt. Type some text in the file and save it. The application that we are going to create, counts the number of characters in this file. 2. Create a New "Windows Forms Application". Name it AsyncExample. 7. Run the application and click the "Process File" button. You will notice the following problems. The application does not display the status message i.e "Processing file. Please wait." While the application is busy processing the file, it becomes unresponsive. You cannot move the form window or resize it. These problems can be very easily fixed by using the async and await keywords. Notice only the btnProcessFIle_Click() event handler method needs to change. The application displays the status message ("Processing file. Please wait") immediately. Even when the application is busy processing the file, it is responsive. You can move the form window around or resize it. async and await keywords are used to create asynchronous methods. The async keyword specifies that a method is an asynchronous method and the await keyword specifies a suspension point. The await operator signalls that the async method can't continue past that point until the awaited asynchronous process is complete. In the meantime, control returns to the caller of the async method. An async method typically contains one or more occurrences of an await operator, but the absence of await expressions doesn’t cause a compiler error. You may have a few questions at this point. 1. Can't we achieve the same thing using a Thread. We will discuss all these in a later video. Very Good Explanation. Thanks Venkat. TPL, TPL DATAFLOW, Difference and relation between TPL and Thread and TPL DATAFLOW. How do you do? Nowadays you are not so frequent like earlier. I think you are busy with you job. I request you to describe LINQ vs PLINQ as you are discussing asynchronous programming. I understand it but I am looking an example in Web Page. But I am looking this example for web page not for windows or console. Can you please help me? I have doubt, how does the async work? Initially I used to though whenever the async method find await, it will be creating the new thread (creating new thread will keep the UI thread free) and later after completion the new thread will join with the UI thread? But to a surprise I found, await call do not create new thread? If it will not create the new thread how our UI thread is free/responsive.